How would you describe these treats that were dreamed up by Brenda Watts of Gaffney, South Carolina? The recipe headnote says it all: "A dessert tray must have, these peanut butter cookie cups are filled with creamy layers of irresistible goodness." Heat oven to 350°F. Place Reynolds® Foil Baking Cups in 20 regular-size muffin cups. Line cookie sheet with Reynolds® Parchment Paper. Spread 1/2 cup of the coconut on cookie sheet. Bake 5 to 7 minutes, stirring occasionally, until golden brown. Remove to plate to cool. In shallow bowl, place remaining 1 1/2 cups coconut. Shape cookie dough into 20 (1 1/2-inch) balls. Roll each ball in coconut, pressing coconut lightly into dough. With floured fingers, press balls in bottom and halfway up sides of muffin cups. Bake 10 to 16 minutes or until golden brown. Cool 3 minutes; remove from pans to cooling racks. Cool completely, about 15 minutes. Remove foil baking cups. In small bowl, beat 4 oz (1/2 cup) of the mascarpone cheese, 1/4 cup of the powdered sugar and 1/2 teaspoon of the coconut extract with whisk until smooth; set aside. 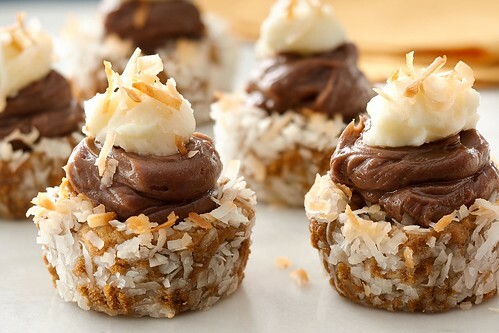 In large bowl, beat remaining 12 oz (1 1/2 cups) mascarpone cheese, the chocolate spread, remaining 1/2 cup powdered sugar and remaining 1 teaspoon coconut extract with electric mixer on medium speed 1 to 2 minutes or until smooth. Spoon about 2 tablespoons chocolate mixture into each cookie cup. Top with 1 teaspoon mascarpone mixture; sprinkle with toasted coconut. Store covered in refrigerator.